I describe myself as someone who doesn’t like Superhero stories, and then I read one and have a blast. I think what I don’t like is the majority of american style Marvel/DC Superhero movies, which is an entirely different blog post, and also an entirely different thing from superhero novels and short stories. 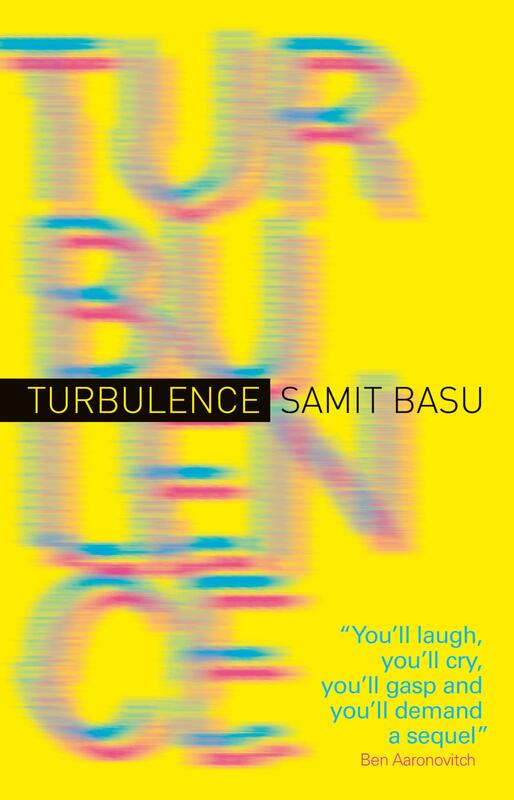 Back in 2014, I had the pleasure of interviewing Samit Basu for SFSignal, and his books have been in the back of my mind ever since. People in India are waking up with superpowers. It seems that everyone on a particular London-Delhi flight ended up with the special powers of their dreams. One person could fly, another became an amazing inventor, another was able to control the weather, another could create multiple copies of themself, etc. A lot of the “look what I can do!” is ripped directly from American style comics, and there’s actually a lot of purposeful joking about superhero names, X-men style powers, and fourth wall poking. Not only is Turbulence a hella fun story, it’s also a love letter to superhero stories. I really can’t say enough good things about this novel. It’s fun, funny, kept my attention, and thanks to Basu’s writing style I was instantly and continuously invested in the characters. The first “superhero” we really get to know is Uzma. She’s moved from London to Mumbai to become a Bollywood actress. Beautiful and graceful, everyone likes Uzma, and she was my favorite character. Overstaying her welcome with her cousin, Uzma answers an ad to rent a room in a big old house, only to learn that everyone who lives there is weird or crazy. The owner of the house, Aman, has figured out that something strange happened on that flight, and he tells Uzma he contacted her because she is powered, and he wants the powered people to stick together which is why when he finds powered people he lets them stay in this huge house for free. What he doesn’t tell her is that people who were on that flight are being systematically kidnapped or murdered, and he hopes by staying together they can protect themselves. Basu takes what are often very serious topics and lightens them up with funny jabs at the comics industry, characters’ banter back and forth, and over the top superhero violence (because none of these people can actually get hurt). Yes, there is a lot of humor in Turbulence, but what everyone is dealing with is not a funny in the slightest. People are being kidnapped, and tortured, and murdered. And even when Aman tries to stop it, he just ends up making things worse. There is also a lot about Turbulence that is uniquely Indian, such as how to navigate the Bollywood industry, societal expectations, cricket, the politics between the different cultures and regions, and most importantly – that so many people in India live merely days away from disaster, be it lack of infrastructure, lack of income, lack of education for their children. I enjoyed that all of the characters are completely normal people. No one is a millionaire, no one owns a successful business, they are just normal people who happen to get superpowers.The characters have banter, they are vulnerable, they attempt to flirt and usually fail miserably, they tease each other, they miss their children and parents, they go on auditions and job interviews. Uzma, Aman, Tia (I loved Tia so much! And you will too! ), even Vir and little Anima, I was invested in who they were as people. Ok, sure Jai is a ridiculous mustache twirling enemy, but when even the bad guys are trying to stop their youngest henchman from harming people because young people shouldn’t be doing those kinds of things, you start to feel for them. And for the kid. The end of Turbulence is solid twists and reveals, and one of them I should have seen coming. But the others? Just fantastic. And that one scene right at the end? Totally broke my heart. If you are like me, and American style superhero stories and movies don’t really do it for you, Turbulence is for you. Yes, there are plenty of hallmark superhero style action sequences, but this is just a great story about people trying to figure out who they are, what they can do, and that even if you can do something it doesn’t mean you should. I’m so happy I finally found a copy of this book! I realize this review has way more instances of the words “fun” and “funny” than I usually use in a review, but it was so refreshing to read a book that was just pure fun to read.